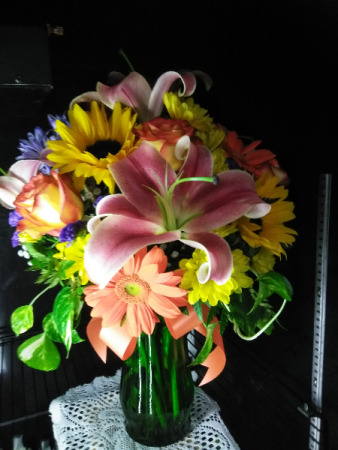 Mixed bouquet consisting of lilies,roses, sunflowers, Gerber daisies and other seasonal flowers and a live plant for keeps in a rich green glass vase. 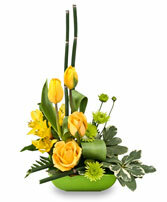 Show your Appreciation with Flowers from A ROYAL BLOOM FLOWERS & GIFTS. It's a Great Way to Honor Someone that Inspires and Motivates You to Be the BEST! Red Roses, Hot Pink Roses, Medium Pink Roses, White Roses, Variegated Pittosporum. 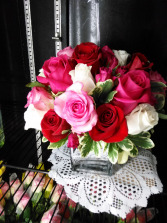 Mixed Rose Bouquet in cube vase, adorable for any occasion. A mix of colorful blooms, including roses, daisies, lilies and snapdragons.